I have attempted to sketch a background in liturgical theology for what we call concelebration; although I must emphasise the word concelebration is a fairly modern term. What I have tried to do is to draw out of the rich and ancient texts and rituals of the Roman Liturgy the implications of those rites. And what we have found over and over again is the sense of the presbyterium as a corporate body; which acts corporately with its head, the Bishop. This gives us our first helpful line on Eucharistic Concelebration. It is at its most natural when the presbyterium of a particular church gathers round its bishop for the celebration, with God's people, as a unity, of the Eucharistic Sacrifice. So Ordinations, Maundy Thursday, and perhaps in the context of a small mediterranean-style polis, the Easter Vigil, are occasions par excellence for this practice. One thinks also of Synods and the like). Vatican II encouraged this approach. We of the Anglican Patrimony do well to remember the perception of our own Eric Mascall, that Concelebration, just like Private Masses, is based on the notion that a priest, when at the Eucharist, behaves most appropriately when he is discharging his liturgical role as priest. Writing at a time when Concelebration was known better in the Byzantine Tradition and the Private Masses were still common among Latin Catholics, Dr Mascall expressed the view that each of these practices seemed theologically closer to each other than either did to the 'middle-of-the-road' Anglican assumption that a priest, whenever possible, ought to mascarade as a layman when at the Eucharist. But we are now far enough from the reintroduction of Concelebration into Western Catholicism to be able to have a fresh look at it. One recalls the observation of an oriental hierarch, viewing one of the big concelebrations of the new Western era, observing that 'When these Westerners get a new idea, they always carry it to extremes'. And, more divertingly, there is the reported phenomenon in Liberal American Catholicism of Concelebration being regarded as Politically Incorrect because it sets up a great male phalanx in opposition to the sensitive feminists at the other end of the church building. That, of course, doesn't worry me. Those ladies are just going to get used to great waves of testosterone wafting down churches. In the Maundy Thursday Rite in the old Roman Pontifical, the climax of the rite was the Consecration of the Chrism: the oil used to confer the Spirit in Consignation and Ordination; the oil which some Patristic texts see as so Spirit-filled as to be comparable with the Blessed Sacrament. This was performed by the Pontiff; but the Pontiff was not alone. If you have read the previous posts on concelebration, you know what I'm going to say: Yup! the bishop was accompanied by a representative Twelve Priests (a significant number?) dressed in chasubles. At the end of the rite, the Bishop breathed on the Oil of Chrism. Spiritus, Pneuma, is breath; the Holy Spirit is the Breath of God; the Bishop is the Spirit-filled Minister of his Church, the pneumatic organ of the continuance of its sacramental life, in and through the Spirit, through space and time. So, like Jesus breathing forth the Spirit upon the Cross, the Bishop breathes the Spirit upon the Oil. And so does somebody else. Yes: again you've got it: so do those twelve parati (chasuble-clad) sacerdotes. With their bishop (they could not do it without him) they halant, breath, the Spirit upon the Chrism. They are one with him; his presbyterium; his corporate collegial body of ministers who apart from him can do nothing but with him share his Spiritual, Sacramental, fecundity. We have been left, in the newer rites, a pale shadow of this collegiality of action, this concelebration, in the rubric requiring the priests present to join with the Bishop in extending their hands during the Prayer for the Consecration of the Chrism. Of course, in the ancient churches of East and West presbyters confirm by virtue of the sacramental authority either implicitly or explicitly delegated to them by their Bishop, and their use of episcopally consecrated Chrism is but one sign of this. And that is why, in the modern Roman Rite, presbyters extend their right hands as the Pontiff says the Prayer for the Descent of the Holy Spirit. The priest is genuinely participating with his high priest in the conferring of this Sacrament. He is a concelebrant of the Sacrament. The Oil of Chrism ... now there's another example of Concelebration. Watch this space. They wear chasubles; they join in with the laying on of hands; the presbyters who partake in the ordination of a new presbyter are real participants and not just the bestowers of a chummy blessing. At a mundane level, they can rightly be seen as a club welcoming a new member or, rather, performatively incorporating that new member. But I also venture the opinion - and here I do speculate beyond what magisterial documents explicitly state - that those presbyters are true ordainers. I am not a presbyterian; I do not believe that those presbyters, either individually or collectively, could ordain a new presbyter without their Bishop. He is central; he is essential; he is the Apostolic Man who incorporates new men into the everlasting sacerdotium of Christ. But his presbyters do it with him. What they could not do on their own they can and do perform with him. They are not individuals; they, in and with their Bishop, are a corporate organism functioning corporately. 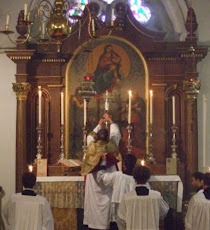 Eucharistic concelebration is not the only type of concelebration in the immemorial tradition of the ancient and venerable Roman Rite (let us never forget its antiquity: Gregory Dix rightly used to emphasise how much older it is than the Orthodox rites which so many people wrongly assume to be older and unchanging). In the Rite of Presbyteral Ordination in the old Pontificals, 'all the sacerdotes who are present' lay on hands, of whom a representative minimum of three ought to be vested in chasubles if at all possible. The same rite was retained in the Church of England at the 'Reformation', where 'the Bishop with the priests present ' impose hands. A recent complication has been the idea of a few Anglican bishops who, with the best of motives, have claimed that this rite is 'just a blessing'. It is not. The Catechism of the Catholic Church, as well as Anglican Canon Law and ARCIC, make clear that this is a collegiate action; an act of shared ministry. The bishops concerned are trying to square the circle of not letting 'women priests' join directly in a sacramental action while simultaneously not upsetting them by excluding them. So the laying on of hands by the presbyters is to be shifted to later than the laying on of hands by the bishop: 'Look,' these bishops then cry, 'it's not the same imposition. After all, in the Roman Rite they don't have the old Anglican [and Patristic] rugger scrum of simultaneous imposition - the presbyters do it separately. It's only a blessing'. But this is nonsense. The Roman documents which teach that the action is corporate and collegiate are referring to sequential imposition by the presbyters after the bishop, and the Anglican sources treating the imposition of hands as an act of shared ministry by Bishop and Presbyterium do not distinguish between simultaneous and sequential imposition. So what is happening here? The important fact about the Catholic tradition of Ministry is that, for us, the nodal minister is the Bishop. But, in the tradition of the Latin churches, the Bishop is not a solitary individual. He is the central figure of a corporate entity, the presbyterium. For example, in earlier centuries, the Bishop, while being the Minister of Absolution and of Ordination, was not allowed to administer either sacrament without the assent of his presbyterium. Gregory Dix, with that impish instinct for using scholarship to deflate prelatical pretensions, enjoyed pointing out that in those earlier centuries, while the Bishop was the sacramental minister, the presbyterium exercised what we would call jurisdiction: quite the opposite from what the structures of modern Church life imply .... and quite the opposite of the idea of episcopacy which twentieth century Anglicans have urged Protestants to 'take into their system'. So what is going on when Bishop and presbyterium lay hands on those being ordained? Having written a rave review of Laurence Hemming's Worship as a Revelation, and repeatedly urged everybody to read it, I think I am entitled to pick up particular observations and express a contrary view. And I want to question his apparent disapproval of Concelebration. Having summarised the way, in the old Pontifical, that newly ordained priests, in their Mass of Ordination, said the Eucharistic Prayer with the ordaining bishop, he observes 'This has nothing to do with concelebration - it is a formal demonstration of the way in which each priest's future recitation of the most sacred prayer of the Mass is intrinsically linked to, and in concert with, what the bishop himself does, as the one to whom he is hierarchically tied, and so this action is a formal demonstration of how the priest acquires, and exercises, his right to say this prayer and effect the miracle of transubstantiation'. I have no problems with any of this except with the opening clause. If Hemming is suggesting that concelebration is a modern fad which misinterprets the ritual he describes, then he is wrong. The acid test is 'May a priest accept a mass-stipend for what he does at his Ordination Mass? If so, then it is a Mass of which he is a celebrant. And the answer given before there is any suggestion of modern liturgical faddery is that he may. The most learned pope before our present Holy Father, Benedict XIV, took this view. So did weighty and reliable authorities such as Gasparri and Cappello. When the post-Conciliar Ritus concelebrandi formally made this into law, it was simply repeating what was already the universal judgement of theologians and manual-writers; what was part of the Ordinary teaching of the Western Church. This is by no means all that I want to say about this subject, but I do feel the need to establish the authenticity of the notion of concelebration within the practice and teaching of historic Western Chistendom.